The Catalan police, the Mossos d’Esquadra, arrested a man from the town of Terrassa on 21 September for plotting the assassination of Spanish Prime Minister, Pedro Sánchez. 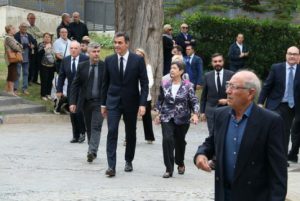 The suspect, an expert shooter who owned at least 16 short guns and 6 rifles, wanted to kill the Socialist leader for planning to remove the remains of dictator Francisco Franco from his mausoleum in the Valley of the Fallen. Aged 63, the man is currently in the Brians 2 prison. A court in Terrassa is handling the case, as Spain’s National Court refused to take it over alleging that it did not pose a terrorist threat. The news of his imprisonment was first reported by the Público newspaper on Thursday, and later confirmed by the Catalan News Agency (ACN).